Discernment, Franciscan Friars, Franciscan Life, Franciscans, friars, Holy Name Province, postulant program, St. Paul Wilmington Del. The postulant year offers men a variety of experiences as they embark on formation to friar life. In addition to meeting friars and visiting ministries throughout the province, postulants attend a number of workshops and retreats. At these and other gatherings, they meet postulants from religious communities across the country, and share the first steps of their journey with others. Fr. 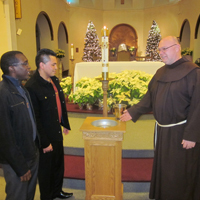 Mike Jones, OFM, pastor of St. Anthony Church in Butler, N.J., gives postulants (from left to right) Junior Joseph and Wilmer Garcia a tour of the church during a January visit. Getting to know the people and places of the Province has been the focus of the last few months for HNP’s two postulants, Wilmer Garcia and Junior Joseph. As the first stage of formation to friar life, “The postulancy program aims to aid men in the transition from secular to religious life. This is a multi-faceted task, but much is accomplished by our being mobile and experiencing as much as can be accomplished in a one-year period,” said Fr. Ron Pecci, OFM, director of the Province’s postulancy program located at St. Paul Friary in Wilmington, Del. In mid-January, Fr. Ron accompanied Wilmer and Junior to St. Anthony Friary in Butler, N.J. Making the friary their “base of operation,” they visited Holy Name Friary in Ringwood and three New Jersey parishes — St. Bonaventure in Paterson, St. Anthony in Butler, and St. Mary in Pompton Lakes. 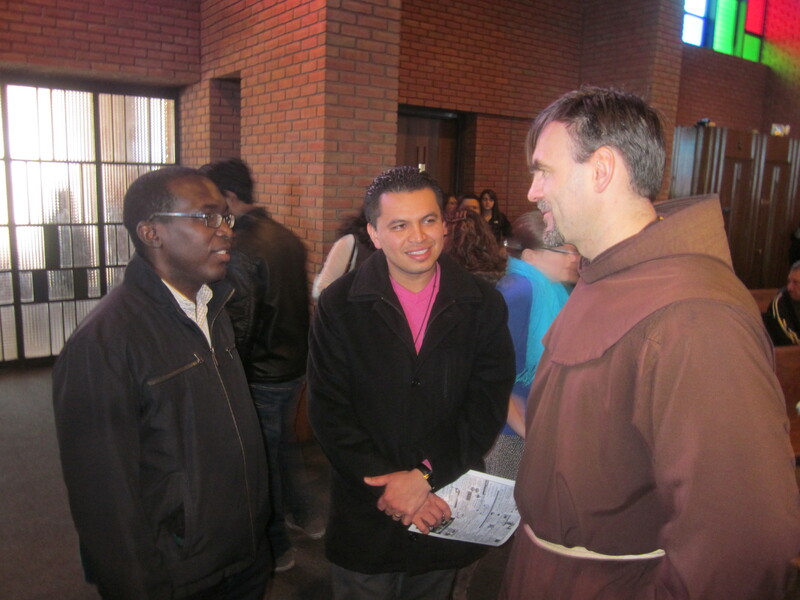 “At each place, we try and meet as many friars as we can and get an orientation to Franciscan life and ministry,” said Fr. Ron. Fr. Jacek Orzechowski, OFM, guardian of St. Camillus Friary in Silver Spring, Md., greets postulants Junior Joseph and Wilmer Garcia. February featured a trip to Holy Name College, the Province’s house of formation in Silver Spring, Md. In addition to getting to know the students and friars residing there, “We visited St. Francis Parish in Triangle, Va., St. Camillus Parish in Silver Spring, Md., the Holy Land Monastery in Washington, D.C., and the Province’s Office for Justice, Peace and Integrity of Creation in Silver Spring. We also received an orientation to the Franciscan Mission Service from development director Br. Paul O’Keeffe, OFM,” said Fr. Ron. In addition to traveling throughout the Province, the postulant year provides opportunities for educational and spiritual growth. During the past few months, Wilmer and Junior have attended religious formation conferences and workshops on a variety of topics, including Franciscan spirituality, poverty and minority, and human sexuality. These events are often interprovincial in nature and include postulants from other Franciscan provinces in the U.S. Adapted from an article by Jocelyn Thomas, director of communications for Holy Name Province, that appeared in the March 27, 2013 issue of HNP Today, the Province’s bi-weekly e-newsletter.